Zadar is located in the centre of Adriatic, well known as the urban center of northern Dalmatia and cultural, transport and economic center of region that counts over 70.000 inhabitants. For visitors who prefer historical facilities and cultural heritage, walk along Zadar will become a walk through history cause its many monuments inside of historical ramparts. 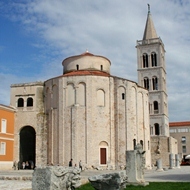 To see the old city center of Zadar is easily to reach by roads. There is the Zagreb-Split highway that connects Zadar with rest of Croatia. Zadar International Airport - Zemunik is just 14 km from city centre.